Editor’s Note: The following was written by Noah Feldman for Bloomberg View. To read the full article, click here. 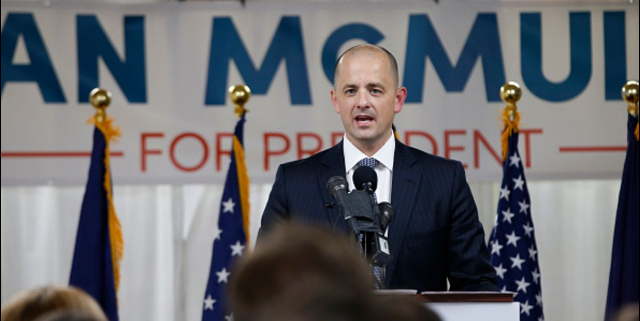 An extraordinary poll released Wednesday showed Democratic presidential candidate Hillary Clinton and Republican nominee Donald Trump both losing in Utah to Evan McMullin, a conservative Mormon ex-CIA officer only on the ballot in 11 states. The best explanation for the rise of this independent candidate is that Mormons, who tend to have deeply conservative values, are genuinely repulsed by Donald Trump. And not just by the crude comments and allegations of sexual assault that recently came to light, but also by Trump’s anti-Muslim sentiment, which the Church of Jesus Christ of Latter-day Saints implicitly condemned 10 months ago. Mormons’ moral consistency has been striking when compared with other religious Republicans. Values evangelicals like the Family Research Council have continued to support Trump despite the mounting evidence that he doesn’t share their ethical or religious values. Some have tried suggesting he’s had a Christian conversion — but there’s no indication that he’s undergone a spiritual transformation from the man he has been for the last three or four decades. The LDS church is not a Johnny-come-lately to condemnation of Trump. In December 2015, after Trump’s proposal to ban Muslims from entering the U.S., the church issued a pointed statement on the importance of religious liberty. He's not married is that correct? Where does this place him now? McMullin can't win. I am voting for the guy that could win and whose policies most closely match my beliefs.....Donald Trump. Yes, I am LDS.